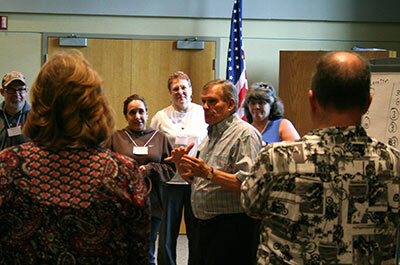 Cowley College was the host of a three-day On Course Workshop June 5-7 in the Earle N. Wright Community Room. The Workshop was attended by teachers, administrators, and student success workers from 11 colleges in five different states. The purpose of the On Course Workshop is to help Colleges improve student success and retention. Dr. Skip Downing, founder of On Course, conducted the learner-centered professional development event designed to provide individuals with dozens of innovative strategies for empowering students to become active, responsible and successful learners. This is the same workshop offered at conference centers across the country. These learner-centered strategies — representing best practices from innovators in higher education, business, psychology, sports and personal effectiveness — help students become full and active partners in their own education. Strategies presented in the workshop improve both student academic success and retention. Dr. Downing previously served as Professor of English at Baltimore City Community College for 32 years. He has been the recipient of the NISOD Community College Leadership Award for teaching excellence and was named in USA Today as one of the 50 best community college instructors in the United States and Canada.